Norway is mostly known for its natural beauty, fjords and mountains, the amazing Northern Lights and the Midnight Sun. The Kingdom of Norway is a constitutional monarchy located in Northern Europe, the western portion of the Scandinavian Peninsula. Geographically Norway is located about as far north in Europe as you can get, and hosts the northernmost point of Europe- the North cape cliff. It is part of the Scandinavian peninsula. 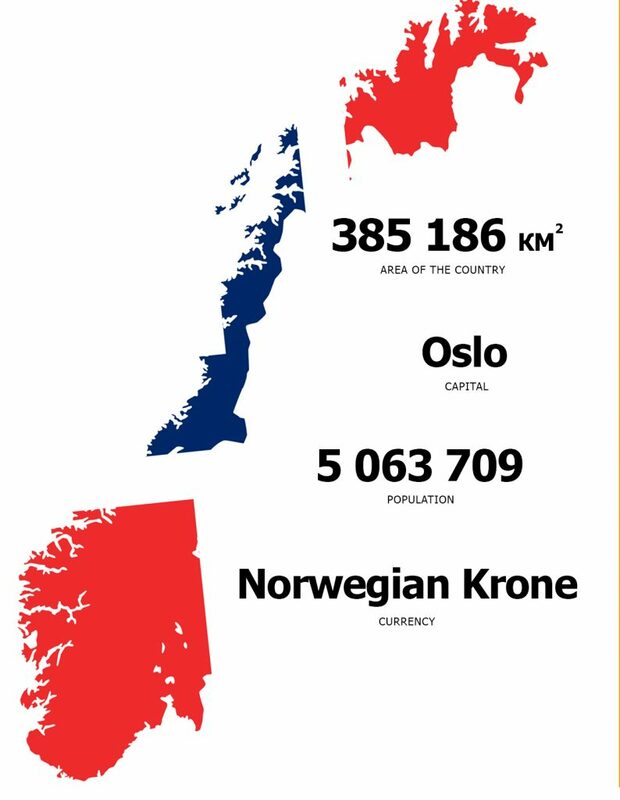 Norway has a population of about 5 million, and it is the second least densely populated country in Europe, with a majority living in Oslo and the eastern parts of the country. Norway has a very elongated shape, one of the longest and most rugged coastlines in the world, and some 50,000 islands off this extremely indented coastline. A vast number of fjords are cutting their way from the coastline into the country, carved out by the ice. The fjords are quite unique and beautiful, but naturally they have also been a challenge for the road planners… thus a ferry crossing the fjord is a typical sight in Norway. In fact, the ferries are defined as part of the road systems. The Arctic northern part of Norway is densely populated, with no railroad connections north of Bodo, and few roads, which are often closed during the winter due to heavy snowfall. One might expect the sea to be frozen during the winter months due to the northern latitude, but the sea is in fact always open thanks to the Golf current passing along the coast. Naturally the sea has been the “main road” for the population along the coast. Fish has always played an important part in Norway’s economy, due to the vast coastline and mountains covering large areas of the country. Only the eastern parts of southern Norway has a topography suited for agriculture and larger farms. Along the coast people typically had a minor piece of soil for a cow and some potatoes, combined with fishing. Thus for centuries Norway was the “poor little brother” of the Scandinavian countries, and was in fact first absorbed into a union with Denmark for centuries, and then into a union with Sweden. In 1814 Norway stood up against the union and adopted a new constitution, but had to wait until 1905 for a full independence. Being poor for centuries, Norway did not have the opportunity to build monumental buildings, like those you find in Sweden and Denmark. However, in the 1970’ies a new era began when it was discovered that the North Sea was filled with basins of black gold – the oil, and these days Norway is one of the richest countries in the world, due to the oil industry, which nowadays is the most important part of Norway’s economy. The oil has contributed to a high level of general welfare, and Norway has set off on a new path towards monumental buildings, like the amazing Opera house in Oslo, opened in 2008. Oslo has in 2013 decided to build a new and modern home to the famous painter Edvard Munch’s paintings, located nest to the Opera house at the Bjorvika waterfront. The spectacular Astrup Fearnley Museum of contemporary art, designed by the famous Italian architect Renso Piano, was opened in Oslo in 2012. The drawback is that the increasing wages in the oil industry has influenced the general level of wages, thus making Norway an expensive country for people from abroad. Norway climate. Due to the Gulf Stream ocean current Norway experiences warmer temperatures than expected at such northern latitudes, especially along the coast, with summer temperatures of around 15 to 20 degrees Celsius, and winter temperatures mostly above zero degree Celsius (+32º F). Even the Arctic city of Tromso does not have very cold winters, with a mean temperature in January of -3 degrees Celsius. The mainland experiences colder winters with snow, excellent for winter activities.